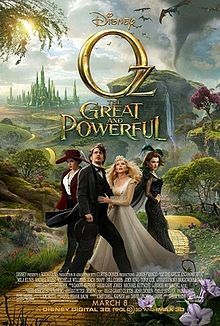 Movie Review: Oz the Great and Powerfull | Why live in the real World? Why live in the real World? Oz the Great and Powerful was just that: Great and Powerful. I liked it because I was a prequel with a concept I had never thought about before. How did Oz become the great wizard he is today? It was clever and I tip my hat to Mila Kunis. SHE WAS AWESOME!!!!! The only problem I have is that it disregarded everything in the play Wicked. I know what your thinking. Lyra888 is probably some girl who is obsessed with Wicked and thinks any Wizard-of-Oz like thing that isn’t like it is stupid. This entry was posted in Uncategorized and tagged awesomeness, mila kunis, wizard of oz, wizard oz.